Play Pretty Blues, the first book by Mississippi novelist Snowden Wright, succeeds almost in spite of itself, risking the generally ill-advised gambit of a Wives of Los Alamos-style first-person plural narrator. The six wives who collectively narrate Play Pretty Blues share a single husband, the ceaselessly mythologized Delta blues legend Robert Johnson. What makes Play Pretty Blues work is a deftly applied motif of historical inquiry embedded in the narrative, as if the tellers of this inventive, fictionalized take on Johnson’s life and legend were plumbing available research materials and faithfully reporting their findings in Wright’s text. Snowden Wright’s new novel, American Pop, takes a similar faux-historical approach, and proves more consistently absorbing than Play Pretty Blues and much more expansive in its sweep. 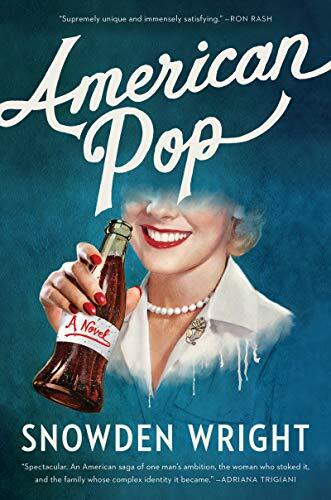 Though too untethered to a timeline and too peppered with sobering spoilers to comprise a traditional rise-and-fall story, American Pop delivers a wondrously mosaic-like, multigenerational chronicle of a family that builds a soda pop empire from a Mississippi Delta drugstore. Their story spans nearly an entire century, during much of which the Forster family reigns as international cola kings, outstripping even Coke and Pepsi in pop popularity. There’s certainly a Golden Age of Soda Pop story to be assembled from Wright’s careful research into industry’s history and the Forsters’ journey to the top—analogous to, say, the comic book and luxury hotel arcs illuminated in Michael Chabon’s The Amazing Adventures of Kavalier and Clay and Steven Millhauser’s Martin Dressler. But American Pop is not that book. It’s almost as if Wright’s aim is to interpret rather than tell a story that exists only in his telling. There’s a bit of Joseph Kennedy Sr. in Houghton Forster, founder of Panola Cola and exacting patriarch to his brooding brood, and more than a little Kennedy Curse in the misfortunes of his affluenza-afflicted children and grandchildren. Likewise, with its scenes of distinctly Southern political arm-twisting and payola, American Pop occasionally evokes Robert Penn Warren’s All the King’s Men and Inman Majors’ more overtly Warren-indebted fictional take on the Butcher banking scandal, The Millionaires. If anything, what makes Houghton Forster’s family quintessential is not Kennedy- or Willie Stark-like ambition, achievement, or hubris, but profound and unerringly relatable personal dissolution and pain, invariably made more burdensome by the family’s prominence. That said, the Forsters do enjoy some indelible moments, whether it’s teenage soda jerk Houghton’s cocky courtship of his high-born future wife, Ramsey Forster’s thrilling affair with Josephine Baker in the fleeting days of pre-Vichy France, or a high-stakes poker game involving an office-seeking Montgomery Forster and the Mississippi Delta slavocracy donor class that absolutely must be read to be believed. But again, it’s the sometimes seamless, and at other times seams-showing melding of history and fiction-imitating-history that makes American Pop a singularly original work. It’s not always entirely clear when Wright is weaving references to real or imaginary historians into the book, but that’s half the fun. As Wright launches immediately into vivid descriptions of the “everybody who’s anybody” in attendance that New Year’s Eve, he delivers an irresistible invitation to a novel and a world that’s simultaneously imagined and real. Wright isn’t overselling his yarn here because he’s already made clear that the drool-inducing version of the soft drink story is the project of someone else’s book, not his. But which version, if any, will Robert Vaughn tell? While his connection to the Forsters is clear, where he fits into American Pop’s meta-narrative of faux-history is not. Arguably, revealing Vaughn as this history’s hitherto-unidentified author would have proven too pat a resolution for a novel that eschews such predictable plot turns. But something about the presence of Vaughn and his open-ended research feels too unresolved, and oddly incongruous in a book that occasionally references its own (imagined) archival underpinnings. That said, it’s hard to fault a book suffused with so many delightful and rewarding surprises for confounding expectations one more time.